The Earl, Patron of CCMI, and The Countess of Wessex visit Little Cayman at the invitation of the Central Caribbean Marine Institute. 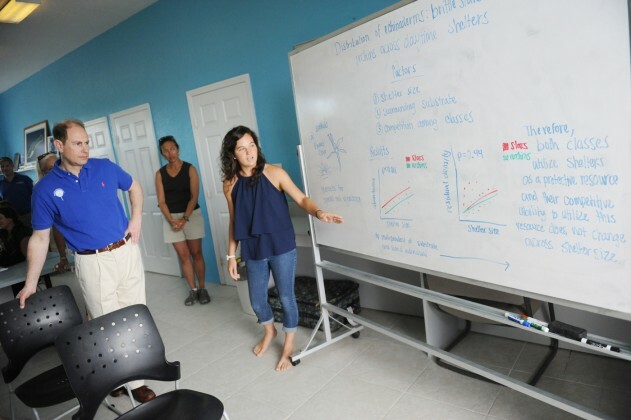 On his fifth visit to Central Caribbean Marine Institute (CCMI), The Earl was joined by The Countess as they received an update on the extensive research and educational programmes that have developed over the last 12 years of the organisation’s existence. The CCMI are creating a hopeful future for coral reefs, vibrant ecosystems that have been the heart of healthy oceans for more than 200 million years. CCMI is a not-for-profit organization founded in 1998 to protect the future of coral reefs through research, conservation, and education. Speaking at the visit, CCMI President Carrie Manfrino said “The visit gave us a chance to really thank our Patron, the Prince, who has helped us enormously over the past decade with reinforcing our work as well as providing input". “It was an incredible honor to have both the Earl and Countess of Wessex visit”. Their Royal Highnesses met with students studying at the research facility, as well as staff and local dignitaries, including Deputy Premier Moses Kirkconnell, Minister of Financial Services and Environment Wayne Panton, members of the public and other Institute stakeholders.